Antique and Vintage Shoes for Antique and Vintage Paws! 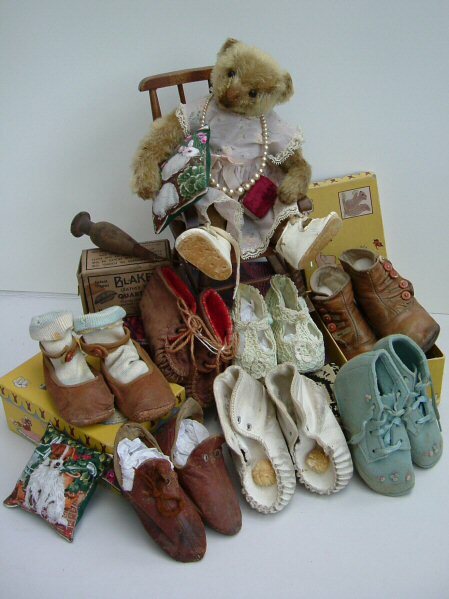 A warm Blue Ribbon Bears welcome to "Ruffles" shoe shop - Antique and Vintage Shoes for Antique and Vintage Paws! Ruffles my dear baby Steiff lives with us all here in Northampton. Northampton has a long history for the shoe and boot trade, with factories such as Churches, Trickers, Barratts, Loakes to name but a few all making their homes here. Ruffles loves her shoes. 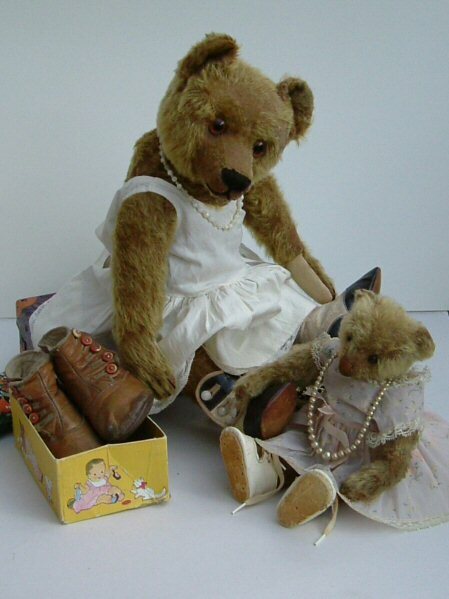 so much so that she has decided with me to host her very own pages on the site, offering her Antique and Vintage Teddy Bear friends the chance to trip the light fantastic in an historical pair of shoes. All the shoes you will find on these pages are little treasures. Some may have taken their first steps nearly a century ago, some will have indeed aided those first wobbly moments, others are Sunday Best shoes...High button boots, Mary Jane's, crib shoes, moccasins, all your favourites here in one shop. Who better to be the next owners of these wonderful shoes, than your favourite old bear. Ruffle as you can see has indeed taken some training in the art of fitting and is happy to check for fit by you sending your bears foot measurements...she will make sure there is room for growth and no claw pinching! 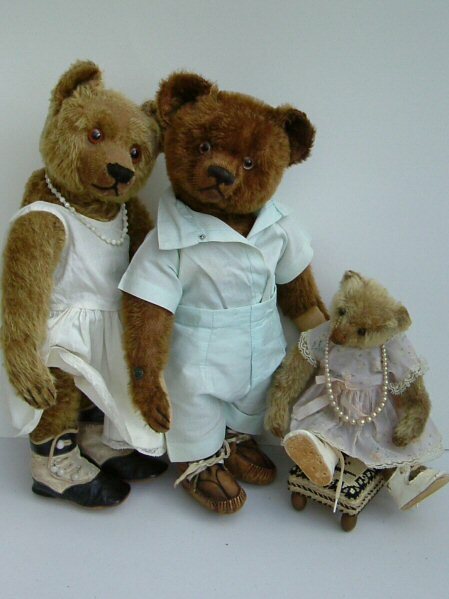 Even Connery my Antique Bing Bear forgot he was still modelling a sweet Girlie dress when Ruffle was fitting his stunning Victorian High Button boots. So, open the screen, walk this way and enjoy a treat for feet! CLICK ON THE LINK BELOW THE PHOTOS TO ENTER THE SHOE SHOP. Please Note, some internet providers ( AOL & Yahoo in particular) seem to have changed their anti-spam software recently & sadly emails from Blue Ribbon Bears are going Straight to the Spam mail box !!! Please check you spam for emails from us if you do not receive a reply, & then teach the anti-spam that blue ribbon bears is NOT spamming you or ay one else.